The opening scene of the documentary Arise is stark. Jane Goodall's call to arms in declaring that "it's time for women to rise up, own their power, and heal the planet" floats in an obsidian sky as a yellow-orange full moon casts her glow, recalling the great Roman goddess Diana, Queen of Heaven, patron of animals and goddess of the hunt. Like Diana, the women of Arise are called by destiny to protect the earth while at the same time utilizing earth's bounty for the nourishment of life and community. Living on the earth responsibly requires partnership. One must replenish what one uses in a spirit of respect and stewardship. There is no longer room on the planet for narcissistic caretakers whose self-absorption and greed is sucking the life from our planet. Is a feminine approach to leadership, stewardship, and commerce the answer? Idanha filmmakers Lori Joyce and Candice Orlando make a powerful case that this is so. 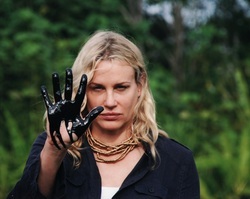 Narrated by actress and environmental activist Daryl Hannah, Arise is both a documentary and an ethnographic study of women from around the world who share a profound intellectual and spiritual understanding of what it takes to live in harmony with the environment. In a twist, "the environment" is not always a pristine rainforest, African savanna, or glacial lake. Broken and abandoned urban landscapes and neighborhood food "dead zones" can provide fertile ground for food bounty with the vision and tenacity of women leaders like Beverly Grant. Grant is transforming a blighted urban landscape into community gardens for Mo' Betta Greens Farmers Market in Denver, Colorado. Global visionaries Vandana Shiva and Winona LaDuke offer profound rationales for securing seed stocks and warn that the exploitation of natural resources is a sure fire recipe for poverty. The film roams the planet from Kenya, Ecuador, India, the Bronx and Denver, but one of the most gripping images is Aida Shibli's yurt, forming the backdrop for her story and vision -- that of a Palestinian Bedouin living in Israel. Her Facebook profile includes the quote, "Your dignity lies in becoming fully human, fully receptive to your own needs and those of others." In fact, many of these visionary women are totally savvy social networkers as you can find many of them on Facebook. Vandana Shiva is a prolific tweeter. Winona LaDuke runs a radio station on the White Earth reservation. Hannah's narration offers a subtle vocal embroidery that enhances the vignettes of poetry, music, art, scenery and interviews that are the Arise tapestry. The narrator keeps her considerable star power low-profile, and as a result the women who are the true inspiration for the film shine brightly. Arise was the official selection at the 2012 Colorado Environmental Film Festival in February 2012, and winner of the "Spirit of Activism" award. The mother and daughter team of team of Lori Joyce and Candice Orland spent seven years bringing Arise to the screen. Joyce has independently produced nine documentaries over the last 20 years including the Emmy nominated, and award winning The Journey of Sacagawea, which is currently airing nationally on PBS. Candice Orlando has worked as a production assistant on several award-winning productions by Idanha Films. She was host and narrator of the PBS Peabody Award-winning documentary, Hearts & Minds: Teens and Mental Illness. The best way to get a feel for the soul of Arise is to watch the trailer (below). Too often promos take only the best scenes, but Arise presents a consistent, finely crafted and well-edited documentary. There is nothing to skip over. Even experienced filmmakers get the opening day jitters, and Orlando was no exception. We corresponded with the filmmakers by email after we viewed a screener. When we screened it for the first time, I was nervous. Thoughts were racing through my head about whether or not people would walk away inspired to create change in their communities and to support women that are doing amazing work all around the world. Through the screening we heard laughter, crying, and applause. Afterwards people were alive and filled with hope. I felt like we made the film in a way that will move people and that was our goal. I am in complete gratitude that women poured their hearts out on film and now we can share and inspire people all around the world with their words and stories. Distribution plans include festival runs, DVDs, Blue ray and online streaming. A broadcast agreement would be a definite plus and Joyce plans to make Arise available to educational, grassroots, environmental and women's organizations for additional screenings. As long as they have the financial means to make it happen, Joyce says, "It is very important to the success of any screening to have the filmmakers present if at all possible." Both Orlando and Joyce expressed a sense of gratitude for the opportunity to create Arise. Joyce says she is thankful for the opportunity to work with women around the world who told their stories through beautiful art, photography and music. "We wanted to make a film that spoke to our own love for the Earth and I believe we accomplished this and much more." Seven years is a huge investment of time, money and emotion. The filmmakers say they "stuck with it" because of an intuitive sense that these stories needed to be told. Both mother and daughter say yes. The fact is that we all have the potential to create change and to be respectful of the Earth for the coming generations. We each have something that we can do to create change within our communities. 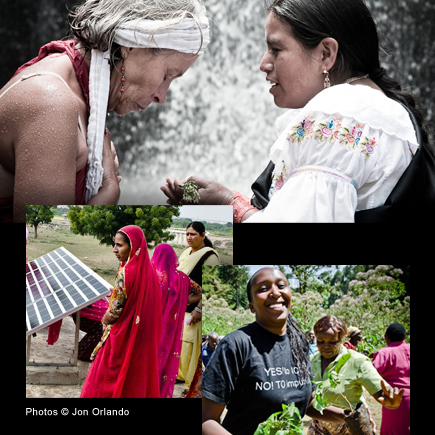 The women in the film made choices, even through many hardships, to respect and fight for human and environmental rights. [We each] have our own roles we can play when make the choice to do things differently. After seeing The Daily Beast and Newsweek's cover story of 150 women who are changing the world, it is a relief to have Arise available as an alternative wish list. We need less focus on entrepreneurship and more on our spiritual connection with all our relations. Less violent "shaking the world" and more careful and considerate critical thinking is welcome. Winona LaDuke tells an important story in Arise of how her people, the Ojibwa/ Anishinabe, came to White Earth, in what is now Minnesota, 9000 years ago. The Creator instructed the people to go to where "the food grows" on the water. That food is what is known as wild rice. The Anishinabe hold their wealth in the land, the water and the animals, LaDuke says. The women of Arise are investing heavily in these gifts from the earth. For more information on Arise, contact the producers at Idanha Films and Mist Productions.